katilda.com: Something about shaking the funk. Disclaimer: I'm one of the most naturally optimistic people you'll ever meet. Cynicism and I, we are not pals. So, the first paragraph below is going to sound like nothing that I normally sound like but I can tell you that it is 100% honest, so that means it's probably something worth sharing because I just wrote that whole post about not being afraid to be flawed and heyyy you just have to get it out sometimes. I could tell this week started out a little off when I woke up on Monday and the idea of writing yet-another-cover-letter made me stay in bed for two extra hours for no reason at all. By Wednesday, I was a mess of gray hoodies and acoustic Dashboard tracks like whoa. Job hunting is the pits. Nay, the armpits. It was hard to take a leap of faith and move to CA only to lose my contract job (aka security blanket) the very day I arrived. It's hard to apply to jobs that I know I'm qualified for (every bullet point on this list, I say!) and hear nada back. It's hard to be told by the umpteenth HR department that "we'll get back to you soon" and two weeks later I'm questioning the integrity and etymology of the word "soon." It's hard to know that I'm a writer (not a designer) and be turned down for writing (not designing) jobs because I don't know photoshop (it's for designing, not writing) very well. It's hard to know that I'm really good (I am! I'm good at this!) at what I do and not be able to figure out why no one else is seeing that right now. It's hard to write a rent check for August and feel kind of sick inside about how September and October are going to pan out. It's hard that I gambled on a potentially glutenous snack yesterday and I've had sharp pains in my stomach for the last 30 hours, because it would be really nice to just eat like a normal person now and again. OK DEEP BREATH END NEGATIVITY VOMIT. I know I'm doing everything I can, and that means the right thing will work out. I really do believe that. But I'm human, and everything lately has been enough to tip me a bit over the edge into the land of wallow. Tomorrow morning I'm getting up and going running. I'll shake this funk off (can that be a new dance craze? shake the funk?) and hopefully be back leading the hopeful chipper parade in a few days. But right now...gray hoodie and acoustic Dashboard tracks like whoa. And something about an episode of Duck Dynasty? 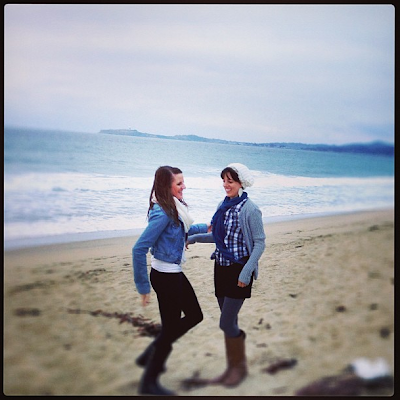 Because what more does a girl really need than a friend, a plaid shirt, boots and the ocean? I love your blog. I think you are an excellent writer, and I have no idea how you are still looking for a job. It is completely valid to be frustrated, and you amaze me with your optimism. It took me five years after college to find a job I like (which I'm currently doing), but it's temporary, part-time, and pays pennies and I know it's just a matter of time when I'll be full-blown back into job hunting mode and battling feeling like I have nothing to offer. I just can't imagine something wonderful won't turn up soon for you though. But anyhow, I do love your blog! I agree, I LOVE reading your blog. I'm sorry that things have been so rough lately! I heard this quote once, that goes, "Every flower must first grow through dirt." Someday soon you'll be sitting at your fancy new job and all this searching will be the best dirt you've grown through! :) Hope you have a good day! I love this post. Keep on keeping on. I just wanna say your writing is magical. Even the way you wrote your negativity paragraph was lighthearted. You can never eliminate that spirit and vigor for humor and joy that exudes from your writing, it's become an ingrained part of you. Every time I think of you, your life decisions, your impact so far in the world, and how you helped me grow in collegio, I am amazed by your influence. I pray a lot for you to be happy and find what you need to feel fulfilled and successful.I guarantee you've impacted countless others as much as you have for me, and we're all rooting for you! BTW, I shall forever approve of Dashboard like whoa. Espesh the acoustic sort. Throw some Penny and Sparrow in there too. Keep at it, Katie. You're going places. Things will work out. That being said ... I highly recommend you invest in an In-Design and Photoshop class. Even if you don't want to be a designer at all, ever. If it will help you get your foot in more doors, it's worth it. Plus unlocking the magic of Photoshop is fuuuuuun! Stuff like this can make it hard to hold to our dreams. It's so easy (and tempting sometimes) to resign ourselves to a lesser, but easier and less obstacle filled, future. Maybe such experiences are one of God's measuring sticks. For me, this is how I show Him how much those dreams are really a part of me. Can I still hold to Christ with unwavering devotion and trust when it seems that my most precious dreams are on the line? Then perhaps I can show that He can give me those dreams because they aren't going to deter me from the most important thing - my eternal future - but instead are part of the hundreds of beautiful facets that makes me shine as myself. God sees me as the star I can be, so I try to trust Him with my dreams, every single one, even when it is really hard. And it's hard. Sometimes it tromps all over you. These are some of my words from last night when I faced the facts that my September/near future might not be shaping up at all like I was hoping for. Maybe they can help you? If not, listen to some more Dashboard girl and draw a picture of a donkey for me. Katie - perhaps you're already sleuthing down this option - but you'd be a FABULOUS freelance writer for magazines! Do you have a recent copy of Writer's Market? If not, the library has one. You can get paid $200-$1000 per article, depending on where you're at. There are many ways to make money without a job - as a writer! I highly recommend checking out "Make A Living Writing" blog by Carol Tice. She's given me lots of good ideas and I've stirred up a nice little side income purely by the written word. Wishing you well in this journey. You're amazing! Loved loved loved this post. You ARE a good writer, that's for dang sure!